Colombian psychologist trained at the National University in Bogotá, Mrs Yolvi Lena Padilla Sepúlveda coordinates Geneva Call’s projects in Colombia since 2008. She is active in the fields of international humanitarian law (IHL), human rights, and the protection of communities. She has also worked with several Colombian NGOs focusing on the protection of children and women who were victims of violence. The laureate has recently played a crucial role in promoting humanitarian demining in the regions of Colombia most affected by the armed conflict. She focused her efforts on those areas most contaminated by landmines and other explosive remnants of war, notably in the departments of Cauca, Narino, Putumayo, Arauca and Norte Santander. She also managed training projects to help civilians recognize dangerous items and take the necessary measures to prevent accidents. Throughout her career, the laureate dedicated herself to disseminating international humanitarian law to the most vulnerable people, which often involved traveling to her country’s most remote and dangerous regions. Thanks to her work, the Nasa, Pastos, Awa, Sionas and Ingas indigenous peoples greatly reinforced their knowledge of IHL and became better equipped to protect themselves from the abuses perpetrated in the conflict zones. Discreet and tenacious, Mrs Yolvi Lena Padilla Sepúlveda is respected by her colleagues for her courage. She recently coordinated with success a training programme to raise awareness of IHL among imprisoned guerilla fighters. As a psychologist, she supported hundreds of victims of violence in the Cauca region, located in the midst of fighting between armed groups, paramilitary forces, and the regular army. 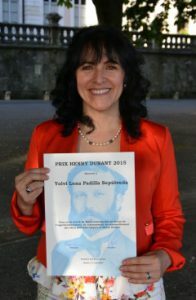 The Henry Dunant Prize – Field 2015 was awarded to Mrs. Yolvi Lena PADILLA SEPULVEDA first in Bogota on April 17th by Mr. P-A Mourgue d’Algue of the Foundation Prix Henry Dunant, and more officially in Geneva on May 11th 2015 at the famous Alabama Room, Geneva Town Hall (read P-A Mourgue d’Algue’s speech in Bogota, an article in El Espectador, Yolvi’s speech in French or in Spanish in Geneva). The liberation of children and teenagers held in FARC-EP camps, participating in the observation, surveillance, follow-up and writing-up of reports, as well as formulating recommendations for the development of this initial process. 13 children and teenagers have so far been released. The dialog between the armed groups and NGOs such as UNMAS (demining) to allow the most affected communities to return to their home territories. The reintegration and contribution of women in the consolidation of the peace process, organizing meetings between the women delegation of FARC-EP and the Network of the wifes of retired combatants of the Insurrection. Alongside this, Yolvi and Geneva Calls continue the dialog with the ELN through their speakers at the Bellavista prison in Medellin ahead of the peace negotiations that will take place in Quito, Ecuador, in February, focusing on the important themes of humanitarian demining and the rights of children. Read the article of the Tribune de Genève (in French), and the press release from Geneva Call about the Geneva award ceremony in French, English or Spanish. Speeches of Elisabeth Decrey and Serge Patenaude (Spanish) are available online. Photo by Carla Ruta, Geneva Call.